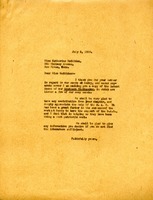 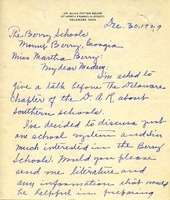 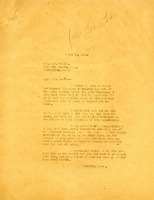 A letter from Martha Berry promising to send information about Berry to Mrs. Holmes for her D.A.R. 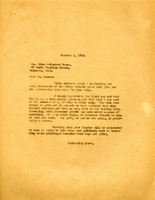 chapter in Scranton, Iowa. 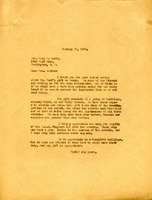 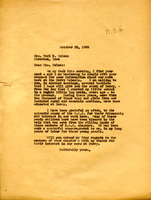 Mabel Herrick writes to Martha Berry about a table that is available at the upcoming exhibit. 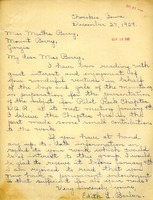 Martha Berry writes to Mrs. C. C. Combs to inform her that Berry will have to cancel its plan to exhibit at the DAR's 39th Congress. 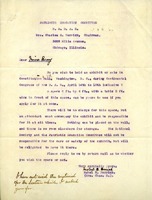 Berry expresses her debt to the DAR for its loyal support of Berry's efforts. 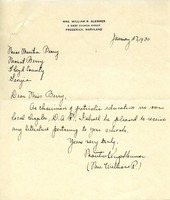 Mrs. Elliott advises that she is mailing under separate cover a box of 12 handkerchiefs that her DAR chapter meant to send before Christmas but it was delayed. 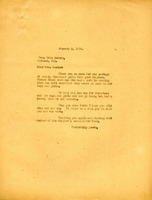 She congratulates Miss Berry on Mr. Ford's gift to the Schools. 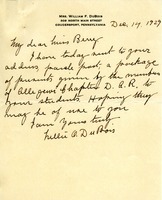 Martha Berry sends her thanks to Mrs. Dunbar for sending Christmas gifts from the DAR chapter. 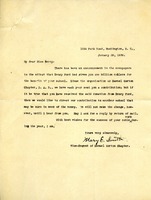 Mrs. DuBois lets Martha Berry know that she has sent a package and Martha Berry sends her thanks in a reply message.